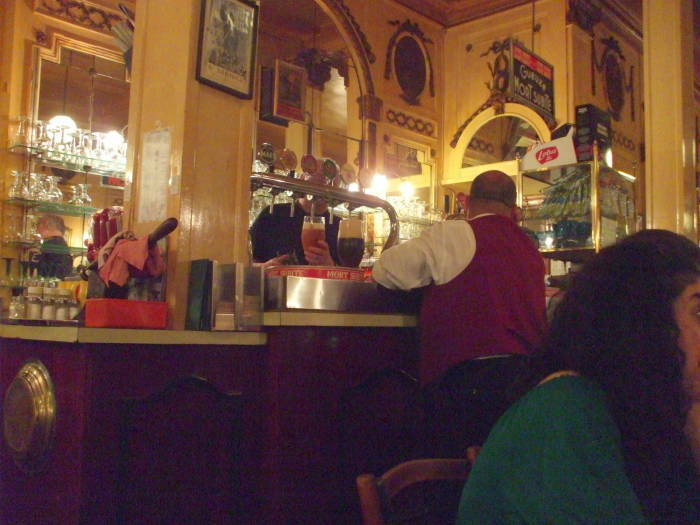 À la Mort Subite is a famous traditional cafe near the Grand Place in central Brussels. It's at 7 Rue Montagne aux Herbes Patagéres. The name literally means "sudden death" in French. It's the term for the final throw in a dice game. 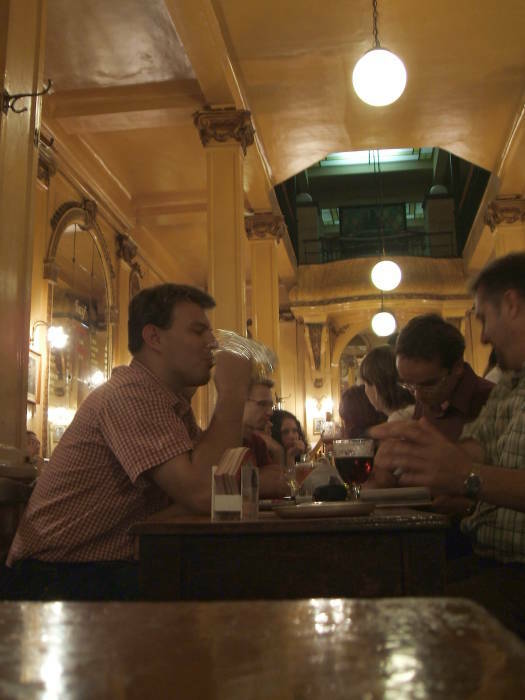 The cafe was once the home of underground financial trading in Brussels. 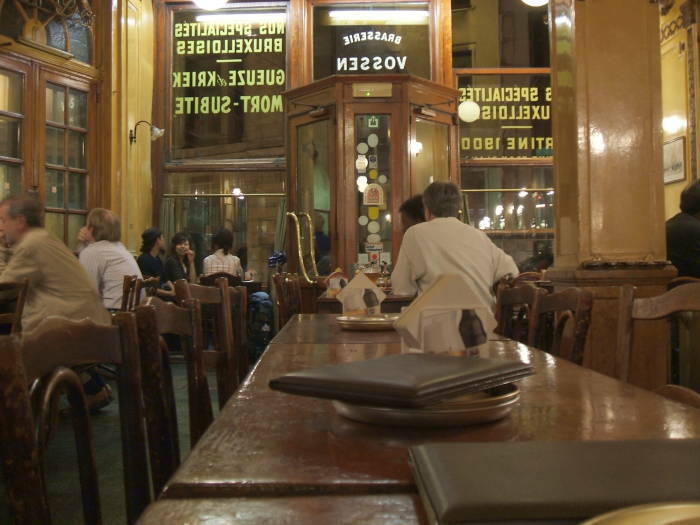 The cafe was named for the speed at which you could lose money in stock trading. It could be as if it were all based on one last throw of the dice. The name has been used for a line of lambic beers, spontaneously fermented with the wild yeast native to the area of the Alken-Maes brewery. See the previous page for details on just what lambics are. The below map shows how to get to À la Mort Subite. 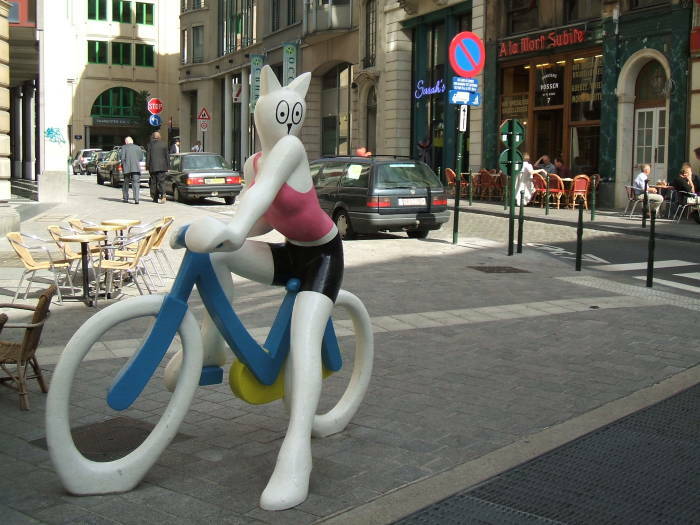 Make your way northwest from the Grand Place, passing through the glass covered shopping arcade Galarie du Roi. When you exit from the gallery you will be opposite the statue seen above — the cafe is just beyond. See the cafe's sign and outdoor seating just to the right of the sunlit "no parking" sign. 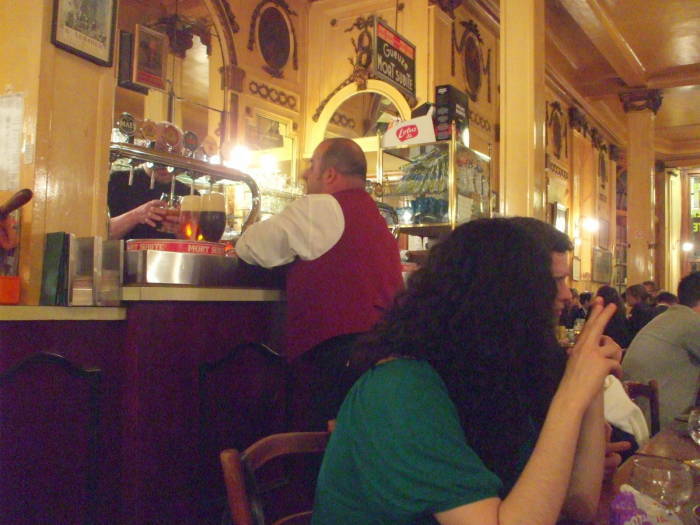 Inside, it's a traditional Brussels cafe with high ceilings and ornate architectural details from around 1900. It's in the Art Nouveau style. 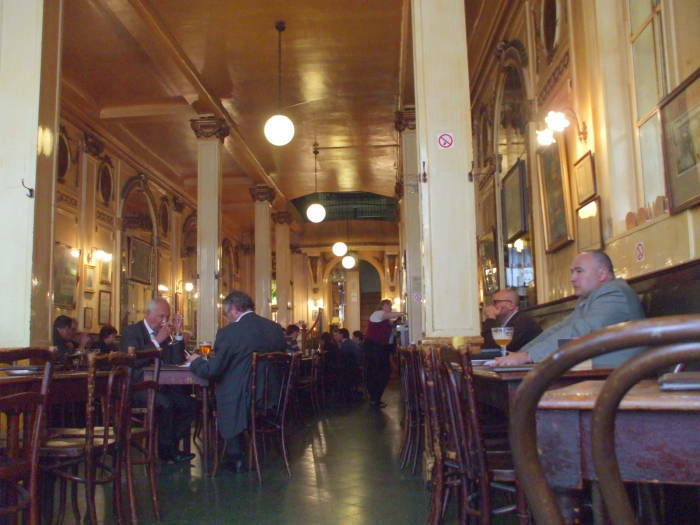 If that era of architecture interests you, see my page on Brussels Art Nouveau architecture. 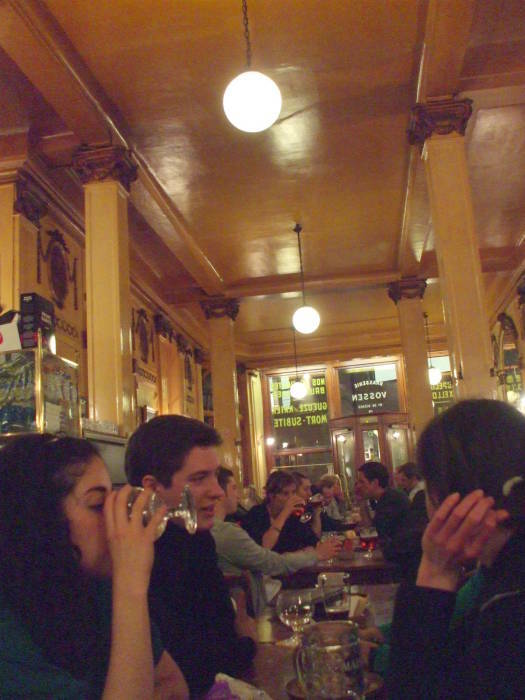 There are long rows of tables down the center of the room, old advertising posters and pictures on the walls. Everything seems to be some shade of yellow, especially in the evenings. 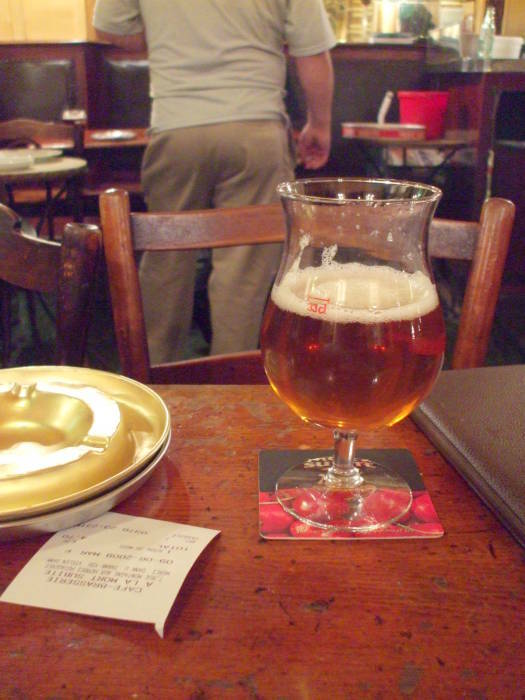 The namesake house lambic is served in tulip shaped glassware. They have gueuze sur lie, a lambic that has, unusually, been bottled. 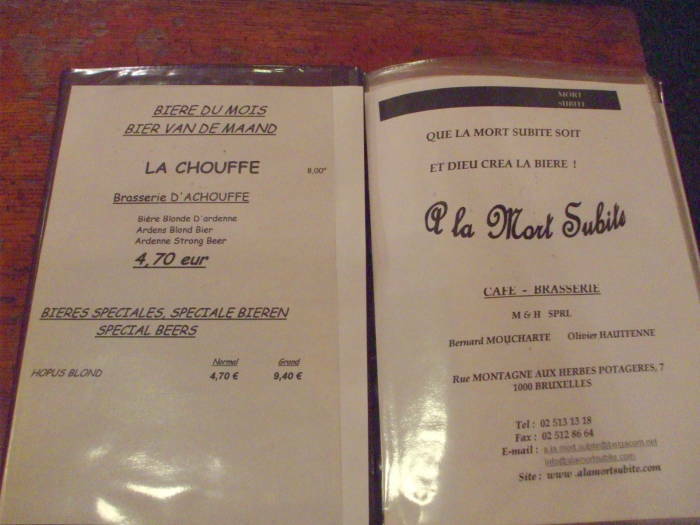 Au fût or on draught they have a lambic blanche or white gueuze, plus kriek (or cherry) and pêche (or peach) lambics. That's just for the Mort Subite line. 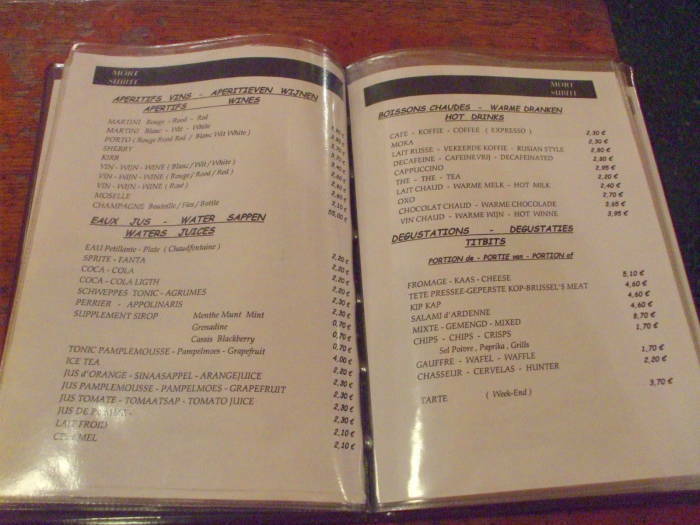 They also have a number of Trappist and Abbey beers on draught. 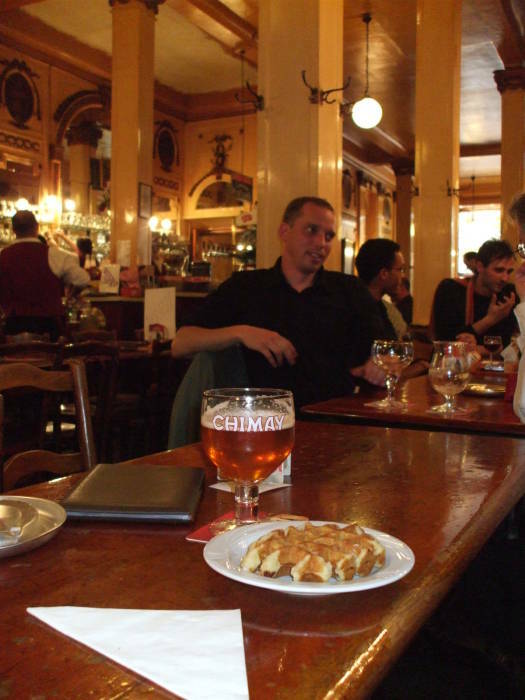 Trappists include Chimay Blonde and Wesmalle Double Brune. Abbey beers include Grimbergen Blonde, Grimbergen Brune, Ciney Blonde, and Affligem Blonde. 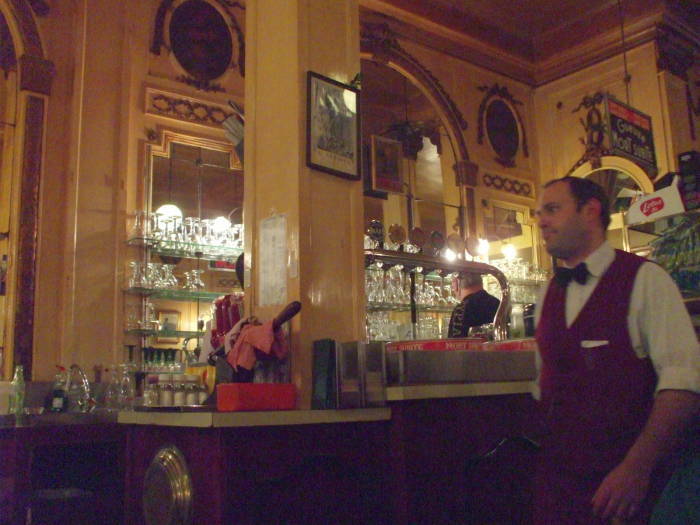 Traditionally dressed waiters hurry to fill everyone's orders. The front of the cafe looks out onto the narrow street. There is outdoor seating in warm weather. It gets busy and hectic in the evening, but during the day it can be quiet. These guys look like they would have been those underground traders back in the days when the cafe got its name. Maybe you would like to look through the carte? Remember that in French speaking countries, the list of choices is the carte. The menu would be the set meal for the day. The beer of the month, at least when I was there, was La Chouffe, a blond beer from the Ardennes region of southern Belgium. 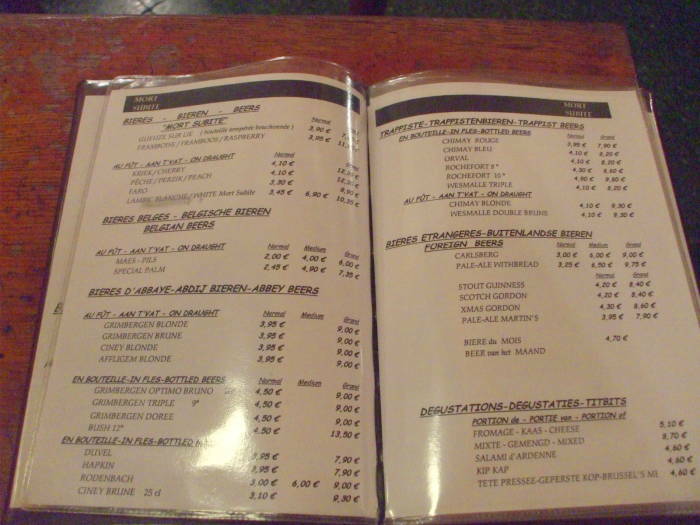 As you see here, most everything in Brussels is labeled in both French and Flemish: Biere du Mois and Bier Van de Maand. Kriek — Lambic artisanal dont la maturation en fûts de chéne se fait lentement et auquel de délicieuses ceries fraiches ont été ajoutées. Gueuze — Bière lambic de fermentation spontanée, brassée artisanalement avec du moût, du froment et du houblon. La fermentation en fûts de chêne se fait lentement. 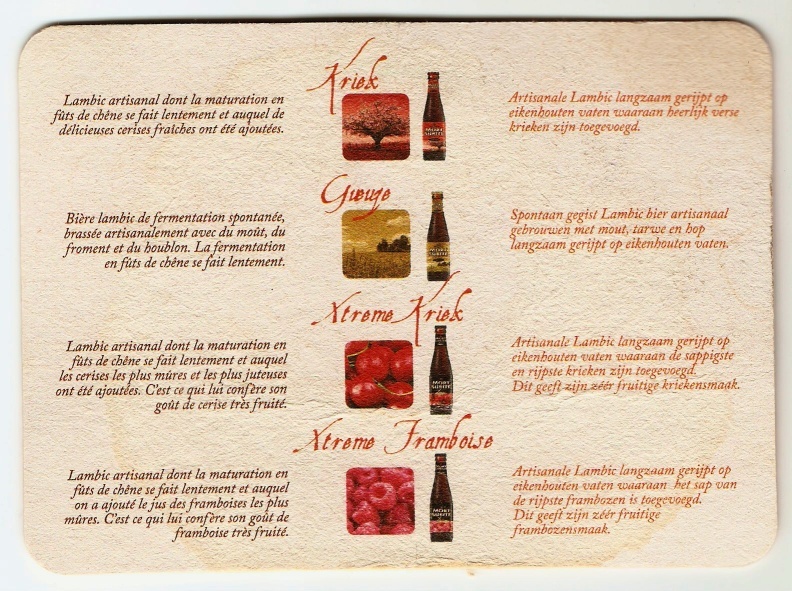 Xtreme Kriek — Lambic artisanal dont la maturation en fûts de chêne se fait lentement et auquel les cerises les plus mûres et les plus juteuses ont été ajoutées. C'est ce qui lui confère son goût de cerise très fruité. 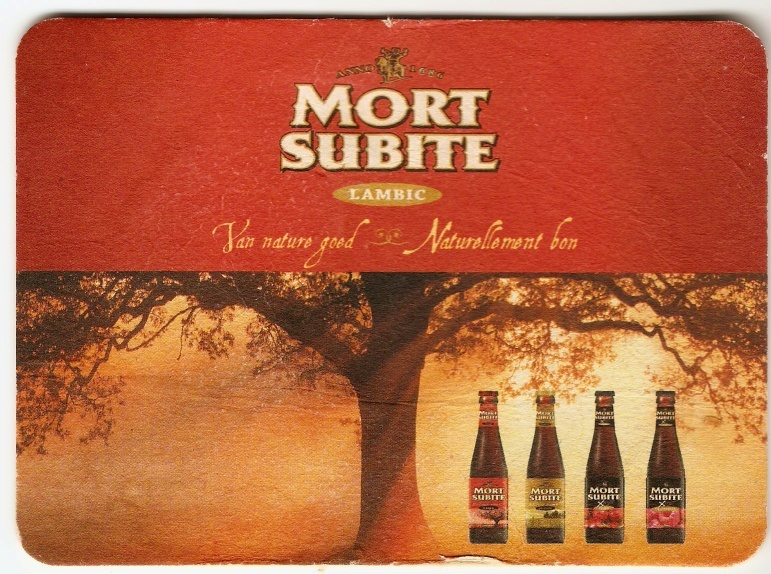 Xtreme Framboise — Lambic artisanal dont la maturation en fûts de chêne se fait lentement et auquel on a ajouté le jus des framboises les plus mûres. C'est ce qui lui confère son goût de framboise très fruité. À la Mort Subite is a cafe, but in the Belgian sense of the word. Just degustations to eat, "tastings" or snacks. No meals. Here is a gauffre, or waffle. It's not a great example, it comes in a plastic wrapper. 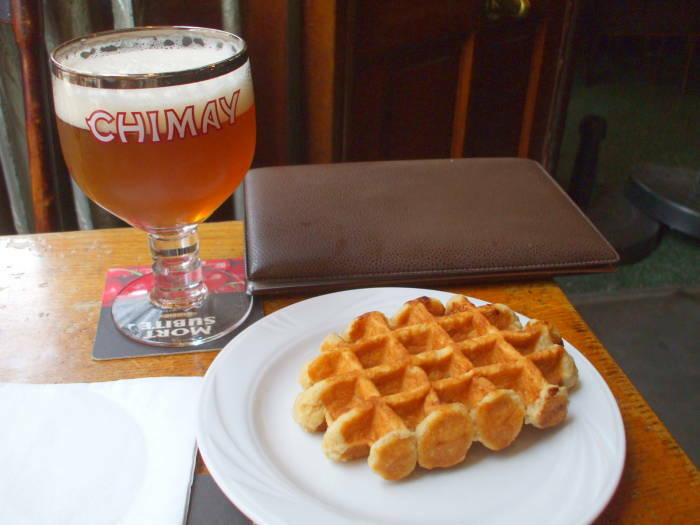 But it is a waffle and it is Belgian. Now we're off to the next cafe!